This was a mouth-watering prospect for anyone with an interest in the conjunction of noise and improvised music: a concert bringing together Ikue Mori (Tokyo-born New Yorker, designer and sound artist) with Norwegian composer and improv vocalist Maja Ratkje, with support from Californian free noise artist John Wiese in tandem with veteran British saxophonist Evan Parker. These four artists have moved in related orbits for years, but have seldom crossed paths; until now. Maja S.K. Ratkje and Ikue Mori are a likewise perfectly-matched duo. Mori has developed her laptop modus operandi from her earlier gig as drummer with paroxysmal New York artrockers DNA. Her stage persona is, at least on the surface, calmer these days, her screen-lit face attentively focused, but there’s a strong continuity in her work. 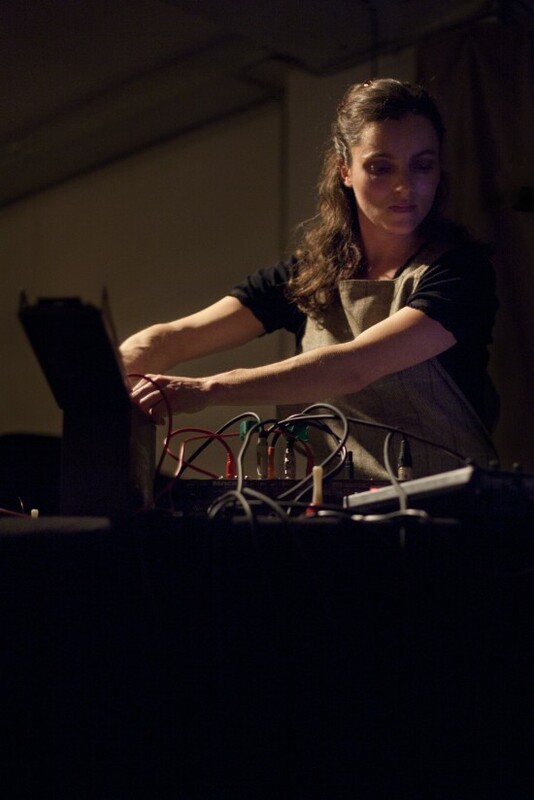 Now, in place of the skeletal irregularity of her on-skins early work, she triggers clouds of teeming digital audio-motes, into which she drops harder percussives like thought- bombs. Ratkje is still essentially a vocalist, although those vocals are chopped and diced and spliced with sundry other inputs, some acoustic (tiny bells, a harmonica, a toy music box), but mostly digital. Sometimes her flurries of vocal ticks even out into a replicant’s dream song. At one point, when Mori allowed a more-than-usually-emphatic tribal gamelan to develop, Ratkje responded with ritual vocalese. Mostly though, Ratkje’s glottic hics and Mori’s electronic sounds teemed together, enmeshed in a sound cloud. Neither duo set outstayed its welcome, each composing a couple of relatively brief performances. That left plenty of time for a final quartet performance, pitting the capricious processed breaths of Ratkje and Parker against the more constrained electronics of Mori and Wiese. They meshed together beautifully, while surrendering none of their individual essences; a vivid, lossless recombinantion of four remarkable artists. Ratkje and Mori are in deep and unbroken conversation throughout. Often the dynamic feels antagonised, argumentative; firing sub-bass shots and plosive grenades into each other’s chests, pinging electronic yelps that zip like pieces of elastic. With Mori sat behind a laptop and Ratkje operating various synthesizers, vocals effects and other toys, it’s no surprise that the latter can afford to be the more physically animated of the two: she convulses and sways from behind the mixing desk, recoiling from the aggressive blows of sound and jerking between shapes in mimicry of the music’s snappier, more erratic rhythmic movements. But pay close attention to Mori’s hands and one can see how her physical manner also adapts to the situation, as she interchanges between sharp zips across the trackpad and the more careful, deliberate strokes. Neither participant holds the floor here, and there seems to be an unspoken agreement to keep the music in ungraspable flux; Ratkje and Mori toe a brittle line of simultaneity, wriggling away from one another but constantly connected, frantically feeding off of an impulse that gifts the music a jittery, pinball dynamic. 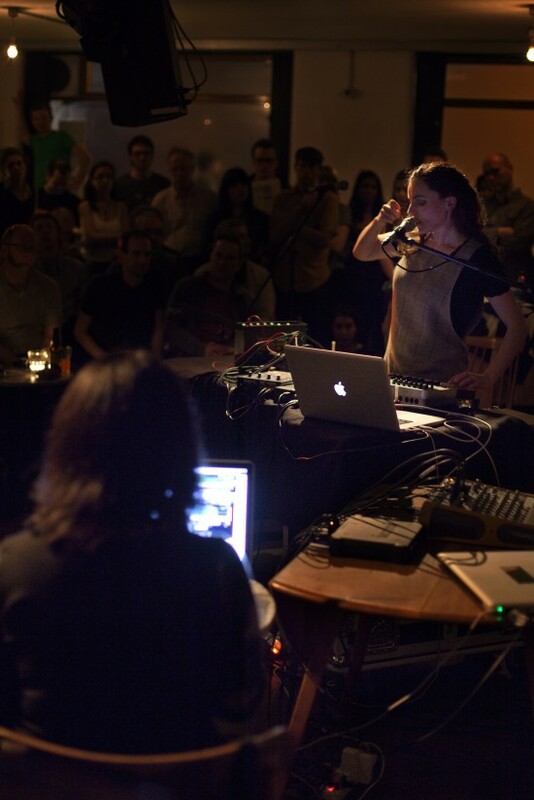 It’s no surprise to see that stereotypes of the “organic” in music are subverted here, with Ratkje’s voice occasionally resembling the hydraulic hiss of machine process, and Mori’s laptop electronics often possessing a fleshy and amphibious squelch. “We’ve got a surprise for you,” announces Ratkje as the performance ends to an enthusiastic applause, and Parker and Wiese resume their seats on stage. What follows is a cacophonous four-way improvisation: laser guns firing into twisted 18-wheeler chassis, chipmunk chatter mimicking bubbling saxophone breaths, platonic ruptures morphing into a crackle of vocal spit. “We thought it might be fun,” explains Ratkje, prior to the whole thing kicking off. It’s absolute mayhem on stage, with each participant jostling for a spot in the audio space, but it’s as fun and enthralling to watch as Ratkje had hoped. This entry was posted in Blog, Other concerts and tagged Ratkje/Mori. Bookmark the permalink.